Hi! Welcome to my blog. I am a retired martial arts instructor, author and spiritual teacher. I have devoted my life to bringing awareness and understanding in regards to spiritual consciousness, the emotional pain and faulty beliefs that are at the root of our suffering and to the special children who are here to help guide us to a more compassionate way of living. My passion is helping people to feel good about themselves. I believe that this is the most important thing for our health and happiness. I am also experiencing a neurological condition [Parkinson’s] and have chosen to heal it naturally and write about my experience. 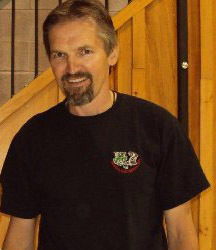 I am a Black Belt in the art of Nagado and former Sensei at Georgina Family Martial Arts in Georgina, Ontario. I hold a Bachelor of Science degree from the University of Guelph. To reach me, send an email to fredphillips.let@gmail.com. Thanks for stopping by and thanks for the info. Overcoming allergies begins with healing the gut, which in turn, leads to healing and strengthening the immune system. You might also want to try Body Stress Relief (if there is a practitioner in your area). It has greatly reduced my trembling. The most important thing for healing is diet…it must be natural and ideally, organic … fruits, green vegetables, nuts & seeds, olive oil & coconut oil, grass fed meat & wild caught fish. Also, a Vit D3 supplement. Also, fresh spring water. SoundEagle read your post entitled “Letting Go – Track & Field and The Principal!” and wanted to comment there, but it seems that the commenting system is disabled there. What achievements you have garnered throughout your life! Congratulations to you for being able to help people to be at peace with themselves and to reach a deeper understanding of themselves, others and their circumstances. SoundEagle hopes that you will find a way to arrest Parkinsons and even to eliminate it from your life. Thank you so much SoundEagle. I really believe I will heal Parkinsons. Cheers! Thank you so much. That’s very kind. Have an awesome day … cheers! A quick visit, Fred, to let you know I’ve nominated you for the Wonderful Team Member Readership Award. You’ve been a valued visitor to my site and foster much positivity and knowledge in multiple arena. So you, my friend, deserve an award, and here is one I can give. For particulars, go to http://numbersatplay.wordpress.com. Blessings! Thank you so much Rayora! I really appreciate your nomination! Unfortunately, I don’t have a lot of time to read other blogs, but I enjoy taking the time to read meaningful blogs and yours is awesome! Hi Eileen. I know a little bit how you feel because of how my life has been affected (I’m typing this with my right hand because I’ve lost the dexterity in my left hand). I also avoid thinking about the future because that’s too scary. Having said that, I believe the body…given the right conditions…is capable of healing itself (just like it can heal a cut), so I’m focusing my energy on trying to figure it out. Best wishes and I encourage you to read all of my PD posts. Hopefully, you will find them helpful. Thank you Dennis and the same to you. Martial arts is definitely good for the soul. I found your blog because you visited mine, and now you have a new follower! I recently began to practice the art of Tai Chi, hoping that it will help me heal my body and maybe even my spirit. Early days yet but I do love the fluid movements of the art form, so that’s a good start. Thank you for sharing your journey with others. Here’s to a healthy 2014. Thank you so much Sylvia. I am sure Tai Chi will help you heal. An awesome 2014 to you as well! I just set up a page for my dad who also has pd to document him. You’re blog is very interesting and I look forward to reading more. It’s great to see a pd community like this out there! Thank you Georgie and thank you for following my blog. Best wishes to your dad. Please send me the link to your page. Your comments on ‘Parkinson’ are extremely valuable , and I greatly appreciative of your honesty for the sake of Patients suffering from Parkinsons affect. Please keep the great service up, May almighty lord bless you. I am from Cape Town South Africa and after 13 years still looking for a cure. You give me hope, especially as I am now trying to eliminate my medication. I really enjoyed reading your story and thank you for all the information. The doctors never give any hope. Always stating there is no cure. Thank you so much Monnica. It is definitely possible to recover from PD. In fact, there are people who have already recovered. I urge you to read Road to Recovery from Parkinson’s Disease by Robert Rodgers and Stop Parkin’ and Start and Livin’ by John Coleman. Coleman recovered from Parkinson’s back in the nineties and Rogers profiles a number of people who have recovered. Both books are available on Amazon. Thank you so much for visiting. It is definitely possible to recover from PD. I recently started to experience an improvement in my symptoms and am blogging about my recovery under the My Recovery from Parkinson’s menu. That’s awesome that you’re in the process of getting off medications. It can be done and there are many things can be done to manage and minimize symptoms. One of the best, is Body Stress Relief which was created in your country. I see a practitioner here in Canada who is originally from South Africa. BSR has helped me enormously with my symptoms. Good luck on your journey and please let me know if you have any questions. All that I can say is thank you. You gave me hope and that is all I needed. All the friends that I know with P.D. oncontrolabel and I did not know if I must go to hospital or stay at home. I’m sorry to hear that Monnica. I hope you are feeling better. Did you go to the hospital? Have you felt like this before? What have you been diagnosed with? What were you doing when when your heart started racing? What were you thinking about? Taking Rescue Remedy, a Bach Flower Essence could help [it certainly helps me!]. I would also suggest that you take an adrenal support, as well as magnesium, as you likely have adrenal fatigue. I would also suggest that you see a naturopath, particularly one who has had experience with neurological conditions. Thank you so much Ysabel! I have learned so much and I love sharing what I learn. It is definitely possible to recover from Parkinson’s or any other condition! Thank you Pam! i have been reading Janice Walton-Hadlock as well. Just out of curiosity, what have you found most helpful about her book? Best wishes to you and your husband, and please keep as posted on his progress! Cheers… Fred! We appreciate your responding: With regards to Janice Walton-Hadlock’s work, LP, likes learning about the case history from all those who have recovered. I feel we are in partial recovery and gaining with every day and new idea or attitude. I myself appreciate the connection that Janice makes to her knowledge of energy and how she traces each PD symptom to channel theory. Her story never ceases to amaze me. Fred, I love that you’re sharing your story and offering help to other in ways they might not have thought about.. What are your thoughts or experience with incorporating ERW (Electronically Reduced Water) into your daily regimen? I was reading about the benefits of increased hydrogen in alkaline water and its medicinal effects and improvements to people that suffer from this disease. Can you weigh in on your experience with it and if you havent is it something that you’ve considered? Thank any keep sharing all the great info and support to everyone! I have completed to-day reg., your curing of ‘Deadly’ diseas (Parkinson), (I too have afffected with the deadly diseas as you may aware) . Extremely sorry if any inconviences. I conversed with you a while back when I was first diagnosed in December and then in April,even with all the natural things I was doing, my energy and my moods sucked. My very sweet D.O. asked me again why I did not want to take the medicine and I just said “side effects”. She informed me there can be 1000 side effects and not one of them would bother me. So, I relented because I could not even get the motivation to do what I needed, such as exercise, etc. Then the pharmacist who had worked for a pharma company,also said, you could take the PD meds, step off the curb and get hit by a bus and they would consider that a side effect. I have been on the med Sinemet since April and I kiss it every time I take it, because it is great!! I now am doing the “BIG” exercise regime, riding my stationary bike, and walking and feeling better. I have my days (mood wise) sometimes, but not as many, or as severe and most of the time feel that I CAN do this, I CAN become more than a disease, which I just call a Dopamine imbalance, I CAN lead a full and happy life for as long as possible! AND I do feel like my spirituality is more important than ever! I urge you or anyone to re-consider your decision–traditional and wholistic medicine CAN work together!! Thank you for your message Cynthia. Let me explain why I have chosen not to take medication, because it has a lot more to do with not wanting to deal with the side effects. First, Sinemet loses its efficacy over time and eventually becomes completely ineffective. I don’t want to have to take larger doses, nor do I want to be in a situation where the medication no longer works, because then as I understand it, things can be pretty dire. Second, not taking medication encourages me to be creative in finding ways to minimize the symptoms I experience. I’ve learned so much through direct experience. Third, I believe that fear is at the root of this condition, so I want to know when I’m in a state of fear so I can dissolve it. Fourth, I’m in complete agreement with Howard Shifke who completely recovered from PD. Howard believes that PD is an electrical condition, not chemical. It is caused by the body being in a constant state of fight or flight, and thus, constantly producing adrenaline, while shutting down dopamine production. Taking medication does not correct this situation, but learning to overcome fear and calming the mind does. It’s fantastic that the medication is helping you, but please don’t stop taking the necessary steps to recover your health. I am totally on board with you, I’m just taking a different tack, because of an exercise routine I’ve learned about from an OT friend of mine, which is unique and retrains/recalibrates the brain. It is called BIG. I have every confidence in this regimen plus what I already do and my diet, my spirituality and stubbornness! I’m fairly new to this arena,yet I can see where over the last year and a half it was coming on but I had no clue. At any point, as my DO said if I had not been so healthy to begin with it would’ve been worse or earlier. Anyway, I wish you the best, because we have to do what is right for ourselves– I just want everyone who has this imbalance to know exercise is key, then comes eating healthy and ‘tude and most of all do not give up! I fully intend on riding my bike in a Woman’s Tour bike ride. We can do this Fred, however we chose to do it as long as we just do it!! Awesome! I like your spirit Cynthia! I’ve heard of BIG, but don’t know the details. Could you explain what it is? I just started reading, The Brains way of healing, by Norman Doidge. The book profiles South African, John Pepper, who has used an intensive exercise program to put his PD symptoms in remission. He did what I’m doing so I’m very encouraged! I appreciate your visits to my little spot. Many blessings. It really is an interesting journey for sure. Nice to cross paths with you. I have to confess, my spirit is one I’ve worked on and continue working on every day! The last couple days, for instance have been tough, but I get through it partly because of exercise, which leads me to “BIG”. It is a series of movements that were developed by two doctors specifically for PD, which as my friend, who told me about and put some of them on a CD for me, said, “they re-calibrate the brain”. Apparently,only Physical Therapists/Occupational Therapists, can be certified to teach them, and my friend swears by them (her father had PD). So, as soon as my neuro doc signs the paperwork and the PT’s office gets the order, I’ll be doing a four week intensive, which involves one hour per day for 4-5 days in those four weeks. I am excited because the exercises my friend sent me help me just that little bit. Check it out! I also have been reading “The Brain’s Way of Healing” and find it to be immensely helpful and inspiring!! I checked it out at the Library, but now am going to order my own copy so I can underline things!!! Very grateful for your blog! I want to encourage you on your journey. My father has PD and I’m determined to find a natural cure.I am a doctor who can call a spade a spade. The meds don’t offer cure so they are not good enough in my opinion. .I will not stop until I find a cure. So far Hulda Clark had some good advice that has cured some people.. I also have discovered that sound frequency therapy for BZ tronics that has made some of my patients stop shaking completely while listening to the sound frequency for Parkinsons. I have also found that a therapy called Neural therapy one attempt made a patient stop shaking completely for 2 days. I believe that is something I want to do again. Another very promising (but pricey) therapy I am planning to get is Resonant Light therapy. It seems to be reversing symptoms in many patients. There is also a therapy called the Personal Tuner which is very interesting by Dr C Crosby…I believe that a combination of these will be able to get rid of Parkinsons. I personally believe Parkinsons is due to Parasites in the brain which harbour a bacteria. I would like to discuss more experiences with you. BTW Magnesium oil rubs help muscle stiffness TREMENDOUSLY. Your story inspired me significantly. It assures me what I am doing is on the right path, with one big exception that I only cut one of the four daily doses of medication the doctor recommended me to take 3 months ago. I can’t imagine how you survive over the past 12 years without taking any medication. I am also a Parkinsonian diagnosed in 2005. I had been ignorant of the severe side effect from the medication for the first 9 years since I started taking medicine to manage the symptoms. I only found I was seriously wrong last year that I finally realized the importance of using the natural healing power. From your Journey with Parkinson’s Disease, I know I will visit your site often from now on. Thank you Morris! I hope you are doing well! Whether you choose to continue with medication or not, I urge you to make your recovery your number one priority! Please check out the blog I posted yesterday on my ideal daily protocol. You might find it helpful. Many blessings on your day! Hi Fred, thank you for sharing your experiences, including how to battle Parkinson’s naturally. A friend of mind at university is working on developing a glove that could help stabilise the hand tremors of Parkinson’s Disease with his GyroGear team. They are now improving the prototype into a final product thanks to the prize they gained from the F-Factor (attended by Simon Cowell, Google’s CEO and Linkedin’s founder). They have gained a lot of media coverage on BBC, the Guardian, MIT Technology Review. What they’re doing make me happy so I wrote an article about it on my blog and interviewed one of the lead engineer working on the glove. Please don’t hesitate to have a look. I think the more people hear about the glove and test it, the more impact they could have in designing the best product possible and reaching the right people. Thank you Fred for taking the time to read the article. Really appreciate it, it means a lot that it is reaching the right people. Yes please drop me an email on thelondony@gmail.com and will forward your email to him! My pleasure! I will e-mail you soon! PS: Happy to share it all on here as well if you feel it OK.
Hi Fred, Here is the email I sent you, hope it helps to serve you all. Wow I am totally humbled and in awe of your blog, thank you so much for writing it and being so honest, raw and positive. My name is Darshna and I am a yogini, who teaches it, does it and loves it, added to that I also do intuitive body work and other holistic therapies. The reason I am writing to you is I want to share a couple of things that might help you a little bit more. I work a LOT with peoples emotional states, I also practice an old healing practice that comes from Mexico called Mexhika Pactli, I guess its easier for it to be seen as a shamanic practice, though like yoga it is indeed a way of life. Within this medicine we do something called Spirit Retrievals, spirit is Life Force it is the essence of who you are, every time you have a fright or an overwhelming experience a part of you leaves your body and runs away, the bigger the fright the bigger the drain o your life force, from this we say disease can manifest in the mind, body, emotions and energy field of the person. A spirit retrieval is about reconnecting you to those lost parts, it recalls whatever your subconscious is ready to receive back to strengthen your life force and help with reducing/relieving the illness. I would happily do one for you however I am based in Sydney, if I can find a practitioner at your end of the world I will share their information with you. Number 2 is a product called 7.2 HydroFX Recovery, it is an American based product that is super amazing in helping alkaline the body, it’s created by a chiro and a scientist and heres a link to some blogs, http://www.sevenpoint2blog.com/, make sure you check out the Canadian/US sites for it if you should want to try it, I feel it’ll really help you. Number 3 The PSOAS muscle is coming out as being known to be very linked to pyschosomatic issues, it is known to be linked to the gut brain and has a huge impression on our Flight/Fight reflex, when it is in stress it can lead to a lot of physical issues, pelvic structural issues, digestive issues, IBS and much more might be linked to it, not to mention stress/fear. Below is some pictures on resting the Psoas, I’d recommend that you do at least 15mins every day of this to settle it down, get a structural assessment and if you can find a Mysofascia therapist to help you get them on board as well. Fascia is also now coming out in holding a lot of cellular memory of our experiences, when fascia is disturbed it takes the muscles out and can lead to structural imbalances as well, I know first hand had a lot of work done and last lot of work put my pelvis back to where it belongs, had the biggest digestive result EVER in all my years of getting better. I like you was an very anxious child, for years I grew up in total fright, I had a bit of a history, got bullied in the home and out, we were chucked out of the country of my birth under a military regime and all of that + conditions of growing up added to my anxiety and fear. There came a time when I realised a lot of it wasn’t even mine and I started a clearing process out of my body, energy and mind, what has been mine I’ve had to work through and as I write this I feel I am coming to a place of peace with all that has been and fear is no longer my ruling factor. I combined my therapies with regular chiro, fascia and of course yoga/meditation help the body strengthen and loosen as well as the deeper soul/spirit level connection. Number 4, I’m a great believer that nothing happens randomly I came across your blog whilst researching more on PD for a client I will soon be seeing, of course I will apply what I have told you to him and share your blog however, I started a 40 Kriya (cleansing practice) in Kundalini yoga 20 ago, today is day 20! In that is a meditation you can do to work with the midbrain and pineal gland, when the pineal gland is functioning to its optimum it sends signals to the pituitary that signals ALL IS OK, this stops our flight/fight responses being activated on all the time. I am sending you the link to the whole Kriya, the part I speak of is right at the end, Kundalini is all about rising the energy upwards, cleansing practices can be strong and I would ask that you be guided by your intuition and maybe even a very trust worthy kundalini teacher. I found this Kriya randomly and am loving it, even though I have been knocked down with a massive cold, which I believe is a huge internal detox and yes more fear was unearthed, I feel strong and have continued very gently through my bout of detoxing. Seems kinda funny that the Kriya is about reducing fear huh. Sorry for the huge email, hope it all makes sense and I would love to hear back from you if you try any of these out how they work for you. Sending you much health and healing for your journey, as well as gratitude for the blog. Thank you so much for all your wonderful information Fred – I am just starting to go through it. So much of what you talk about resonates with my own PD experiences although I’m a newbie, only two years in. I also believe my body can heal itself and that if I can clear some of my ancestral trauma that I carry in my DNA that I can maybe even contribute to past healing that has been carried through generations. Thank you also for confirming that more gentle exercise can be more healing for some than pushing oneself to the extreme which feels intuitively wrong to me. I wanted to share some of the supplements which have really helped me as well – I know we are all snowflakes and different and you may have already explored many of this. Many blessings – you are an inspiration to those of us on this path! Fred. What supplements do you use currently for PD? Thx, Adam. Hi Adam! I am presently taking magnesium citrate, magnesium oxide, magnesium malate, vitamin C, vitamin B12, vitamin E, multivitamin and an adrenal supplement [Natural Factors Stress Relax Serenity Formula]. Q do you have eczema? Oily face neck sebacous gland areas? Thank you Lil! I have eczema on and off. At the moment, my skin is clear, I think due to the medication. I think your blog is fantastic. I’ve spent the last 10 days or so going through your whole blog from day 1 and found it fascinating – with all the various approaches and treatments that you and others have put forth. …. plus all the videos and links to other websites as well. Thank you for posting all of that. My own situation is a little different. Last December I was diagnosed with non-tremor Parkinson’s by a neurologist in Oshawa. He also prescribed some L-Dopa which I declined to take. Then in February I went to another neurologist in Toronto who did a much more extensive 2-hour assessment and came up with a new diagnosis of atypical Parkinsonism; more specifically she said I had corticobasal ganglionic degeneration. And she wants to refer me to a colleague at Sunnybrook who specializes in atypical Parkinsonism diseases for further assessment. But what’s really interesting in my case is that in January I was tested for heavy metal toxicity (urine challenge test) and I came up with very high levels of both lead and mercury and several other metals as well (tin and thallium, etc.) I was pretty shocked when I got the report. So my homeopath and I are wondering if this could explain my symptoms. Anyway, since then I have been undergoing EDTA chelation treatments in Barrie as well as amino acid IV, vitamin C IV, and glutathione IV – all to support my brain function. And lately I’ve also added in Plaquex IV. A number of these other IV’s do double duty as detoxification agents. One thing that has started to improve is my brain fog, that is, I have much less of it. So what I’ve found in all my research is that there is a very high correlation between Parkinson’s (in fact, all neurodegenerative diseases) and heavy metal toxicity. I’ve been listening to Mark Hyman’s Broken Brain series in which he talks about this connection. So I’m hoping that with time the rest of my symptoms will eventually also fall by the wayside but I understand it may take up to two years. Anyway, I just thought I would share my own experience on your blog, if you don’t mind. Hi Marianne! Thank you so much for sharing your story! I admire your decision to stay off medication! These neurological conditions are perplexing regardless of what the diagnosis turns out to be. In my experience, there are a number of potential causes and usually more than one. What symptoms are you experiencing and for how long?